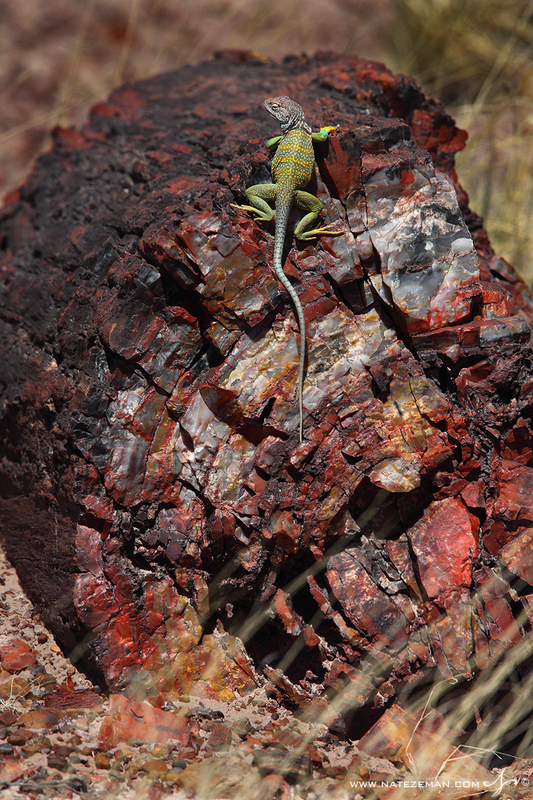 A collared lizard warms itself in the sun on a piece of petrified wood. Petrified Forest National Park has some of the largest and most colorful examples of these fossilized trees. It is almost hard to imagine the time scale when it comes to petrified wood. Once upon a time, ancient trees fell into river channels and some were buried by sediment. When the sediment buried the trees fast enough, they were completely cut off from oxygen. This allowed minerals to take over the cells in the tree and eventually filled the mold of the tree. They are now fossils, perfectly preserved in rock and showing the same shape as the original tree. The trees in Petrified Forest are around 225 million years old. To put that into perspective, this is just about the time dinosaurs started to show up, and many millions of years before they would rule the earth. Related Galleries: Small Mammals / Lizards / Misc.